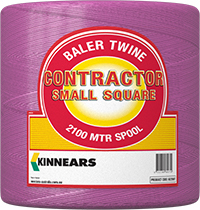 A long standing and reliable twine from the Kinnears family, Contractor® is for general small square baling. Bright pink colour for excellent visibility on and off the bale. * Based on 3’ x 15” x 18” bales size and 2 strings.